Take a child to a place of grown up note. Take them there: and wait for them to surprise you. Because they won’t be bored. But they will notice all the things which go under the adult radar. Today we took a picnic to The Vyne: a familiar haunt of Jane Austen and her family (her brother was the village vicar), a Tudor mansion visited in its heyday by Henry VIII and Elizabeth I. It was bought by a speaker of the House of Commons whose descendant, John Chaloner-Chute, was great friends with Horace Walpole, the man at the forefront of the Gothic design movement and creator of Strawberry Hill in Twickenham. A house with charming corners, it also has its fair share of sombre dark panelled rooms, hung from top to bottom with stunning portraits spanning four centuries. Its staircase, dating from about 1780, is a classical study in light and elegance: but the whole has a feeling of showoff dominance.As I stroll around, I confess, I smell power. The young have a very different perspective. Maddie was most anxious to return to the Vyne. Because the Vyne is where the stunt ducks live. They hang out at a tiny escape stream which runs from the ornamental lake into the pond. It’s white water for beginners: a stone slope down which weed and algae grow and water scoots, screeching to a white water halt in the deeper calm water at the bottom. The ducks edge up on their webbed feet until the current becomes too strong, and bears them stolidly surfing back down to the green waters. And today there were ducklings. They would walk fearlessly up in the face of the current and thrust their whole heads beneath the water to forage, sending showers of sun-shimmering droplets up around them. The children spotted an open door which had never been open before, in a red brick, domed building which has always puzzled me. Problem solved: it was a Summer house, a sign inside said. Folks would have most of the courses of their meal in the big house, but they would have the final one here in this little garden idyll, a round-walled round-roofed snug surrounded by delphiniums and lavender. Later it became a tea-house. And latterly the pigeons claimed it, and the elegant plaster crumbled from the walls because pigeons are not too particular about their surroundings. Once in the house we trailed round, and the children rooted out the stove which heats the great long conservatory with huge black pipes; Phil sniggered at a family portrait in which the husband clearly found the whole sitting business transparently tedious; and Maddie found a late 19th century wheelchair fashioned out of bamboo. The strangest things caught their eye. At the top of the stairs lay Felix’s reason for trailing round a great old house. It was a camera obscura. Have you ever seen one? They have been around since the Ancient Greeks and Chinese discovered they could project an external scene through a small hole into a dark room or box, where it would arrive upside down. And sure enough, there was a perfect little moving scene arranged on a piece of sketching paper within it: we watched tiny upside down people the size of a pin stroll across the upside down lawn in front of the upside down lake. Children notice the funniest things. Posted in Places to visitTagged Chaloner, Chute, history, Jane Austen, The VyneBookmark the permalink. Endearing images of children, and ducks, and that magnificent tree, out in the garden. I agree, the house is a bit self-consciously “imposing” for my taste, but its bucolic surroundings are quintessentially England to me. Thanks for another interesting outing with the Shrewsdays! PS I’ll bet Robin Coyle has conniptions over the library – it certainly is splendid! Maybe the wish is the first step…..
Felix and Maddie are most fortunate to have a mom and dad who are not only fascinated with their fascinations, but know they will learn too! Those little ducks are adorable. Ooooh, I really fancy a trip to Clifton observatory! It certainly shows us things we would never even think about otherwise, IE! The portraits are just stunning. The ducks aren’t bad either. Beautiful house. 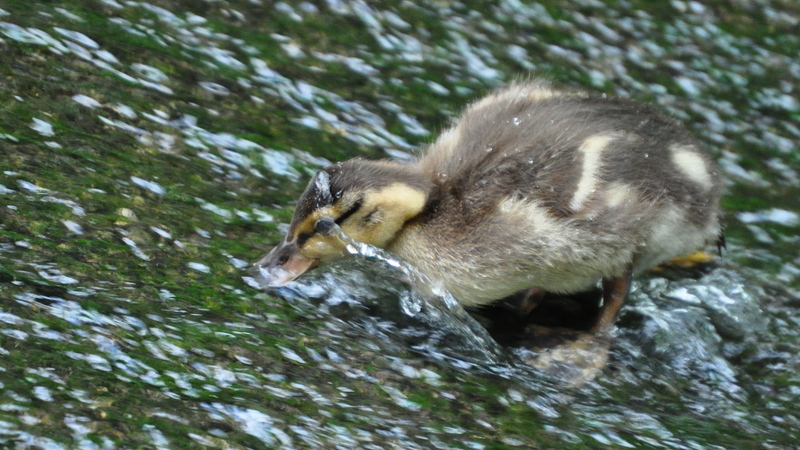 Love the photos Kate, that little duck braving the flow of water is well caught. If only we could still see the world as children, but you are wise Kate. You observe what your children heed and see which makes a whole world of difference to being a good parent. I hope so, Rosemary: it’s a balancing act, this parent business, isn’t it? I have about 100 pictures of those ducklings. They were little stars. More wacky ducks to enjoy. Wow, Lou! Red carpet ducks! Glitzy! I love the way kids see the world. They sometimes take note of so much more than we do. As an adult, I’ve tried to learn from them. It was also with much forethought that the builders and designers of The Vyne put in features that would delight children and adults alike. How I would love to be there exploring and seeing it all through the eyes of your children, Kate. Ha! I’ve seen those Peabody ducks Lou Mello posts in action. Twice. It is almost as much wacky fun to watch the people who watched the ducks. 😀 I expect their faces are a picture, Penny! That stunt duck looks like it is enjoying itself… Kate, I always think ducks have smiles on their faces… I don’t think its ONLY children who see the funniest things. Beautiful images.. must have been a lovely outing..
Just loved the stunt ducks and it’s so true, children see magical things where we sometimes walk too fast to notice them! Lovely post Kate! Lovely blog, Kate and so true. We used to take ours to National Trust properties and we’d all have a great time because there were always things that fascinated them or wonderfully mown sloping lawns for them to roll down! Love that tree with the spectacles! And the ducks. And the whole place – I think I could live there. Beautifully written. I agree that we can learn so much about how to be “in the moment” from kids. Hi Diana! Thank you for taking the time to comment! Teaching is reciprocal, isn’t it: a learning journey shared….